Through the glass doors of what only a year ago was an HSBC Bank on a commercial street in London, Syrian Berlin-based artists, Hiba al-Ansari and Fadi al-Hamwi, had their first joint exhibition this June. 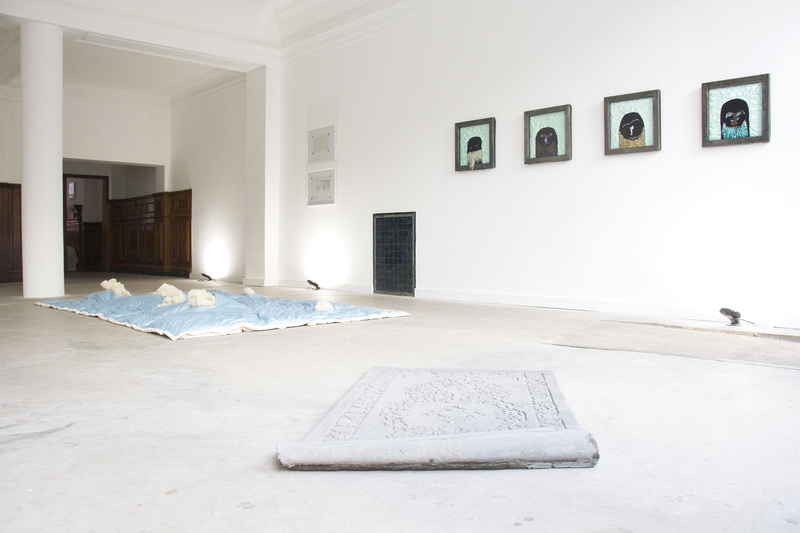 Curated by Berlin-based collective East of Elsewhere, the exhibition “While You Were Sleeping” was hosted by Vardaxoglou, a nomadic London gallery that occupied a former bank on Brompton Road this summer. “While You Were Sleeping” housed a collection of domestic furnishings distorted and deconstructed by the two artists to reflect the consequences of conflict seeping into everyday life. Al-Ansari’s uncanny Untitled (2016) portraits welcome the visitors to the gallery. They are composed of traditional Bedouin bedsheets and colorful beads that simultaneously embellish and obscure the figures represented in the striking portraits. Al-Ansari created the portraits from deconstructed home goods conjuring both warmth and distance, referencing the contradictions in everyday experiences of war. Directly across from the portraits are al-Hamwi’s vast Spoils (2017) and Spoils II (2017), two giant canvases with charcoal drawings of cow carcasses. The sheer size of the canvasses forces the viewers to confront the grotesque iteration of death embodied by the cow carcasses and denies visitors the luxury of looking away in the face of atrocity. Where the beaded eyes of al-Ansari’s portraits look back with a blank stare, the hollowed eyes of al-Hamwi’s carcasses are dark voids recalling undisguised emptiness. Occupying the space between these two sorts of eyes, the floor was covered with contradictions, including a carpet made of concrete and a sheep’s wool duvet with its insides ripped out. 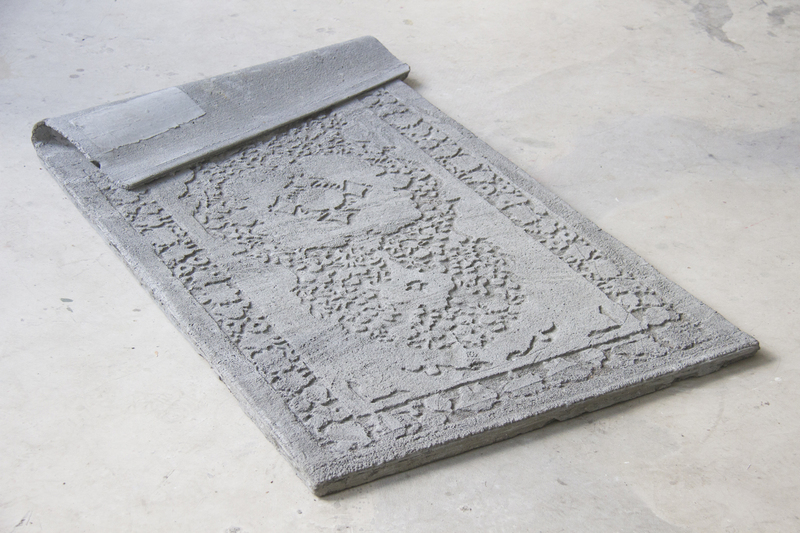 Al-Hamwi’s Irrational Loop of Dust (2017) is a literal conjuring of a far-away home, considering that al-Hamwi recreated in concrete the carpet from his family’s home in Damascus. “While You Were Sleeping” invited the visitors to interact with the object and contribute to its wear and tear which would be natural in a domestic space. 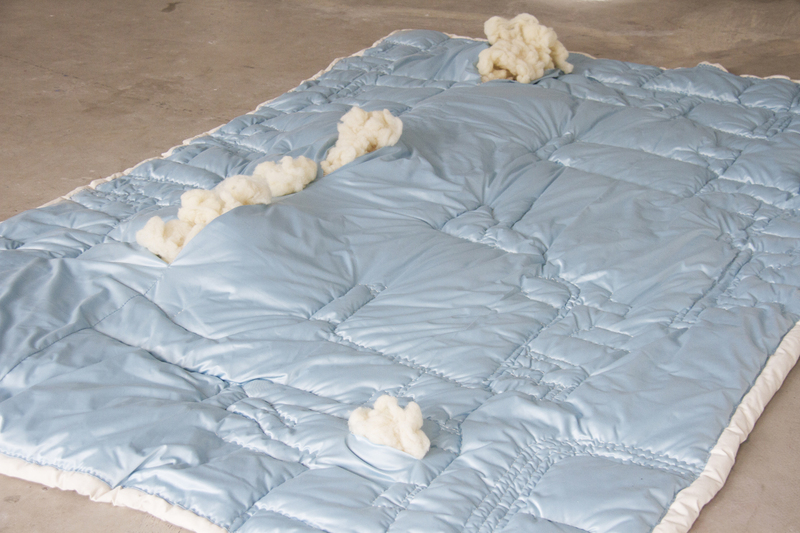 On the floor, next to Irrational Loop of Dust, lay al-Ansari’s Decke (2017), a light blue duvet that the artist embroidered with a street map of her hometown, Rahkka. Rahkka — a city captured in 2013 by the Syrian opposition and then by the Islamic State of Iraq and the Levant (ISIL) - was made the de facto capital of ISIL in 2014, which made it a target for airstrikes by the Syrian government, Russia, and the United States. To represent the destruction of her hometown and mark the sites of explosions on the embroidered map, al-Ansari ripped open the duvet and tore out its sheep’s wool filling. On a nearby wall, she presented sketches portraying the city streets before and after aerial bomb strikes. The sketches serve as essential reminders that this violence is grounded in real events of mass scale. Decke simultaneously evokes the destruction of a city and the consequences for the individual. The back room of the bank-turned-gallery hosted Al-Hamwi’s installation Over My Bed - a single bed covered in a white sheet and melted toy soldiers scattered across its surface. Al-Hamwi began collecting toy soldiers in 2012, at the start of the Syrian Civil War, when a military checkpoint was erected between his home and his art studio. He started buying one toy soldier every time he passed through this military checkpoint on his way to the studio. 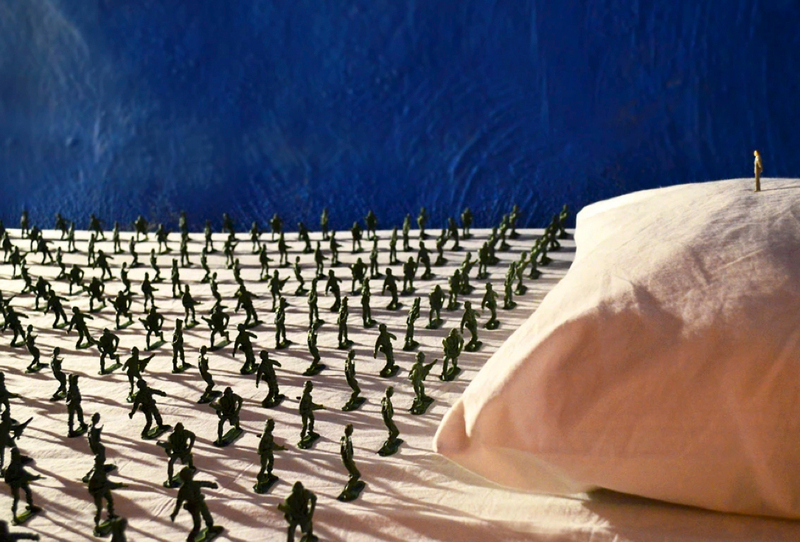 Over My Bed was originally presented in 2012 with unscathed toy soldiers. This year it was shown with melted toy soldiers — green splotches on a crisp white sheet. 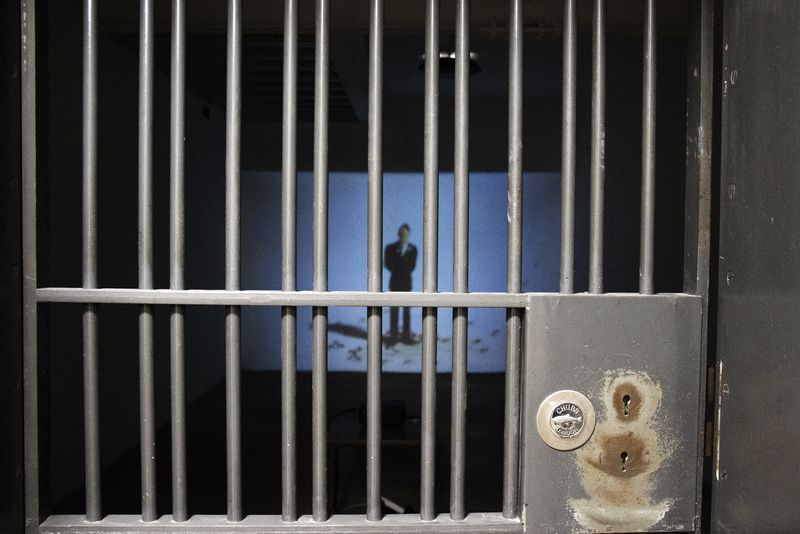 A photograph of the original installation invited visitors of “While You Were Sleeping” into al-Hamwi’s bedroom in Damascus where he installed the piece six years earlier. Down the stairs, in the basement, in a vault, the references to domesticity were cut short, but the theme of impotence in the face of an overwhelming force persisted. The faceless figurine in al-Hamwi’s video work Artificial Sugar (2015) were surrounded by ants, then toppled over and slowly taken away by the ants. Al-Hamwi’s sugar-coated, suit-clad, faceless figurine is another mundane object in an altered state. The distorted materiality of familiar objects and the corrupted iterations of home goods in “While You Were Sleeping” showcase the consequences of conflict seeping into the mundane and forcefully integrating into daily routine. What was once soft and warm, becomes melted and torn. “While You Were Sleeping” was on view at East of Elsewhere hosted by Vardaxoglou from July 13th to July 20th, 2018. Fadi al-Hamwi’s work can be seen next at East of Elsewhere's presentation at The Others Fair in Turin, Italy from November 1st to 4th, 2018.